Today we get to enjoy an inside look at the life & designing career of our October Guest Designer Meredith Cardall of Meredith Cardall Designs. Read on to learn all about Meredith… and be sure to enter our giveaway contest for a chance to win Meredith’s gorgeous new kit “Things My Mom Taught Me” created especially for Log Your Memory! Please tell us a little about yourself … your family, your background, pets, hobbies, etc… My husband and I have been married for 10 years this month! I am a mother of 2 adorable yet rambunctious little girls. Hannah is 7, Ainsley is 4. We live in the Salt Lake Valley in Utah. I have been scrapbooking since I was in high school, which was so long ago I won’t tell you how many years that is! I have been digital scrapbooking since March of 2005. I love to cook, read, sew, craft and pretty much anything else crafty! Are you a digital, paper or hybrid scrapper/designer? What do you like most about this method? 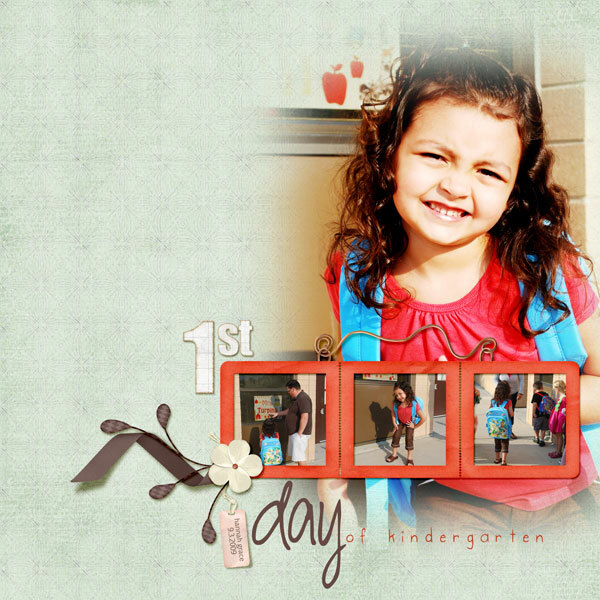 I am a digital scrapbooker and designer. Although I immensely enjoy all things crafty, I am not very good at any of those things! My hands just can’t do what my brain tells them to do. I love that in digital scrapbooking, my computer is a much better tool than my hands! How long have you been a designer & how did you first get started? 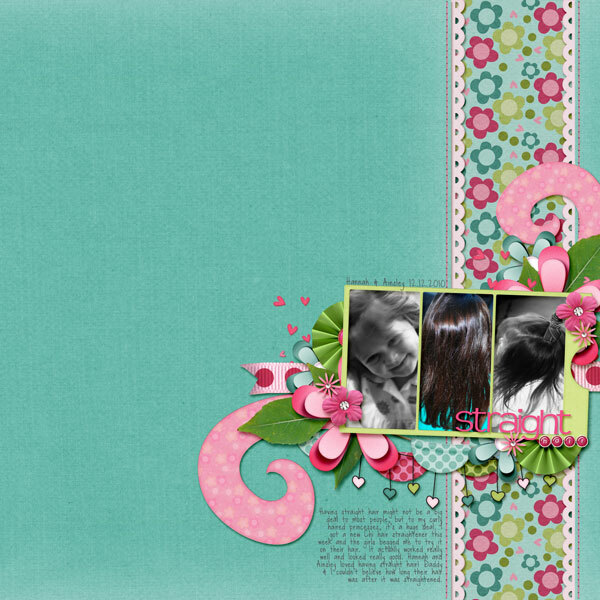 I began creating scrapbook papers and elements for a non-store scrapbook site back in June 2005. I did that for several years. In 2008, I began creating QuickPages for Krystal Hartley. A store-owner approached me and asked if I would be interested in creating QuickPages for their store and selling them. I agreed and within a month I was designing kits! That was in September 2008. Is scrapbook product design your full-time job? If not, what else do you do? I am a full-time scrapbook designer, although my pay doesn’t reflect full-time work! 🙂 I love that this career allows me to stay home with my daughters. I also babysit 3 other children on various days, but never at the same time! What software & platform do you use in your design work? Do you use any other special tools? I am a PC girl. I recently learned how to turn ON a Mac and this was a huge step for me! I design in Photoshop CS4, Illustrator CS4 and ArtRage Studio 3. I have a Genius tablet, but most days I want to throw it out my window. I’m saving my pennies for a Wacom. Has your design style changed over time? What has influenced this? When I first started designing, I looked around at designers I considered successful and watched what they were creating. I was trying to mix a lot of other people’s styles and make them cohesive. I leaned pretty heavily on commercial use designs and I think my kits blended in with everyone else’s. In January of this year, after several issues with CU items, I decided to just not use them anymore. I have a considerable stash of beautiful CU items so this was really scary. BUT, what this did for me, is it forced me to learn new things. It forced me to work on my extraction skills. It forced me to learn more about layer styles and more about the tools I have available to me in both Photoshop and Illustrator. I do still use some CU actions and layer styles, but I always modify them so that my products are completely unique. What is your biggest challenge as a scrapbook product designer? My biggest challenge is marketing! There is a very fine line between being visible and out there for the world to see and being obnoxious. I would rather err on the side of being less visible than being obnoxious. What has been the biggest reward or most fulfilling aspect of being a scrapbook product designer? The most amazing thing is when I browse galleries and see my products being used. I know that sounds silly because that is the whole point on designing these products. But these aren’t just pages for advertising, these are someone’s treasured memories. These are what they are hoping to pass down to their children. I am always honored when I see a page using my designs. How long does it typically take you to design a full kit from concept to delivery? What is your process? It really depends on the kit. Some kits flow together and can be completely finished from concept to zipped up in a single day. And those are typically my favorite products! Most of the time, I spend about 20 actual work hours on a kit. I have a notebook that I carry with me almost everywhere. I scribble ideas and doodle all over it. When I get enough doodles and ideas to form a cohesive kit, I put them in a binder. When it’s the right season or holiday or I just feel like creating a kit based around a specific theme, I pull it out of the binder. Then I pick a color scheme. I usually create my solid papers first, a few patterned papers, then I do all the elements and go back and finish up the papers and then pull together an alpha. What is your favorite kit and why? I love my Bushels of Fun kit. The colors are my good mood colors! I love this time of the year between summer and autumn. How do you incorporate “real life” scrapbooking into your personal & professional scrapbooking & design work? I make sure to scrapbook real life. Not only do I have pages of my children smiling and happy, I also have pages of them screaming and fighting. I scrapbook them when they are sick. I scrapbook their successful ventures as well as their not-so-successful ventures. History repeats itself and we learn from our past. I want to depict an accurate representation of our family life so that our descendents know who we really are. I tend to be a positive and upbeat person naturally. I love to depict that side of me in my scrapbook kits. Life isn’t always sunshine and flowers, but I still like to use them on my scrapbook pages! My Road Trip kit has a lot of journaling options that talk about the not-so-happy sides of taking a vacation with your family! What fills your time when you are NOT scrapbooking? When I am not scrapbooking, I am usually designing. When I am not designing, I am usually doing my PTA duties, planning church youth activities, taking care of my family or generally avoiding cleaning my house! What advice do you have for fellow scrapbookers interested in pursuing the scrapbook product design field? Digital scrapbook designing is tough. Don’t expect to jump in and make a full-time income immediately. It takes a lot of hard work and dedication. But it is a really rewarding career as long as you are realistic. Learn everything you can, and then keep learning. As soon as you think you know everything you need to know, you’re setting yourself up to fail. Anything else you’d like to add? Thanks for this opportunity! I am so grateful to be here at Log Your Memory this month! And now, the kit Meredith created just for us to go along with our October Challenge Theme “In My Experience: Life Lessons, Roles, Philosophies” from the 2011 Memory Logbook. This kit will soon be available for purchase from Meredith’s store, but one lucky Log Your Memory blog reader will win the entire kit for FREE in today’s Guest Designer Giveaway. To enter, simply leave a comment below sharing one thing your mom taught you that still impacts you today. One random winner will be drawn from all comments received here on the blog as of 8 p.m. (Mountain) Sunday, October 23rd. Our winner will be announced next week on the blog. Good luck! My mom taught me how to work hard–she had her 4th child over Thanksgiving Break (some years ago) and was back to work on Monday!! What did my mom teach me, that left an impact today? Show your children (and tell them) how much you love them, and tell them how proud you are of them, no matter how small the achievement is…Teach them: where there is love, there is family. Mom taught me that there is a good side to everyone and I try to always find that side in people. Gorgeous kit Meredith and would love to win. First let me say I love the colors and would really like to win this kit, thank you for this chance to do so. One thing my mom taught me that still impacts my life today would be willingness to be open-minded. An example I have known all my life that I have 2 half sisters from my fathers first marriage, last year I got the chance to meet one, I jumped at it. We talk about every 2 months and are in contact on facebook. My sister and her sister did not want anything to do with getting to know the other side of the family. Through her I was also able to get to know my fathers sister. This is how have been able to further my knowledge of his family genealogy. My half sister and I have a great relationship. I am working on relationships with my “new” cousins. Has kept me from inserting foot into mouth, many a time! One of the most important things my mum taught me was how to cook. She worked part-time and sometimes my dad me used to get the dinner ready for when she got home from work. I do a mean roast beef and yorkshire puddings. Hope it is ok that I leave a life lesson that my daddy taught me since I grew up living with him. I never ever ever understood why, *living in Texas*, we had to wear tobggans (southern version of a knit hat) on our heads to keep us warm in the winter. I swore to him that I would never make my children wear one. Well, that only held true until the day I had my daughter just before winter and anytime she was outdoors, her head was covered. She has carried on the tradition, even though vowing the same as I did, that her children would never wear one, to put the toboggans on my grandchildren before going out in the winter time! Daddy knows best, even though when your a teenager, parents can be the dumbest people in the world! Love my Daddy and love your designs Meredith! !